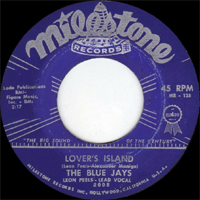 The Blue Jays perfectly represent the transitional era between '50s R&B and the '60s soul era by singing doo wop-styled songs with a gospelly lead Vocals. 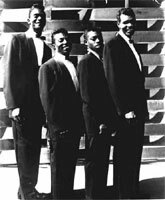 They are best known for their 1961 Top 40 hit "Lovers Island," which many consider to be the last hit record in true doo wop style. The Los Angeles-based Vocals quartet — Leon Peels (b. 1936, Newport, AR), Van Richardson, Alex Manigo, and Leonard Davidson (aka "Len" and "Tree Tall Len") — came together in the suburb of Venice, CA, in 1961. Following an appearance at an amateur show at the Fox Theater in Venice, the group were put in touch with country singer Werly Fairburn, who signed them to his Milestone label. Milestone's roster consisted mostly of rockabilly bands and had already achieved some success with the Paradons ("Diamonds and Pearls"). 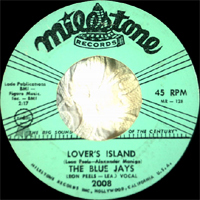 The Blue Jays' first single "Lovers Island," written by Peels and Manigeault, seemed almost like a throwback to an earlier time in Vocals group music. Though it was not a big seller like other Vocals act singles of the time by groups like the Jive Five or the Dreamlovers — it charted in the pop Top 40 at number 31 and performed well on the local L.A. R&B charts — it served as a beautiful swan song for the doo wop era. 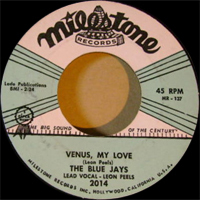 Milestone also released an album pairing the Paradons with the Blue Jays. The group followed their hit with singles like "Tears Are Falling" (1961) and "The Right to Love" (1962), but nothing came of them and the group broke up in early 1962. 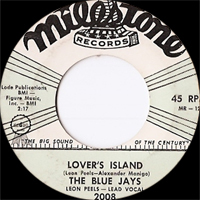 Leon Peels later recorded a number of singles — including "On a Magic Island" — for Whirlybird Records, backed by the Hi-Tensions.